At first, I was a little taken aback. Do we dare pray to God, “Answer me quickly”? What about all I said in the “Long-Term Visions” posting? What about all those verses about waiting on the Lord? But look at the reason the Psalmist asks this — “My spirit fails.” We humans do have trouble with long-term visions, and long-term trials. Our spirits grow faint. What comforted me about this is that God knows that we grow weary. He lets us ask him to hurry up. He knows that we are human. He knows that long-term difficulties are hard on us. The psalmist also says, “Do not hide your face from me or I will be like those who go down to the pit.” This says to me, when my spirit is failing, that’s when I’m utterly desperate for God. If I still have Him, I can make it through. And He will not hide His face when I am desperate for him. Verse 1– I asked God to please come to my relief. I was in trouble and desperately needed help. Verse 2 — I felt horribly guilty for my part in hurting my marriage. But took such comfort that God does not remember our sins forever, that God forgives a repentant heart. Verses 3 and 4 — I felt horribly depressed and crushed. Things got worse. I felt like I might as well be dead. Verse 5 — I remembered all God had done for me in the past. I knew I could trust Him now. Verse 6 — I spread out my hands to Him for help. My prayer times took on a whole new desperation. The Psalm goes on, with the verse I began with. This trial is getting old — please help quickly, Lord! My spirit is failing. for I have put my hope in you. Notice it’s not necessarily a solution to all his problems — the Psalmist is just asking for “word of your unfailing love,” a reminder that God’s love never, ever fails. Just something to lift that failing spirit. Also direction. Encourage me, and show me what step I should take today. The last verses of the Psalm ask for deliverance (for I hide myself in You) and guidance and ultimate victory. From several different sources and in several different ways, people have been mentioning to me lately that these long-term trials are all about the big picture. Ultimately, what is God doing here? I can be sure that this story will ultimately be about His amazing and unfailing love. Last week, my son brought home his artwork from 8th grade Art class. I was especially tickled with his Library Scene. 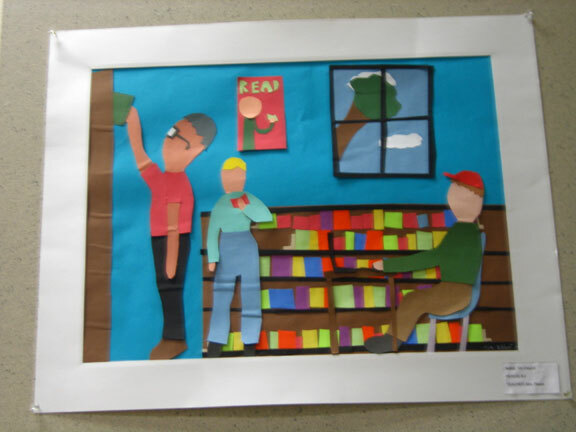 It was all done with cut construction paper. The assignment was to make a scene with at least three people. Today we had some silly fun at the Library. (It was my boss’s idea!) 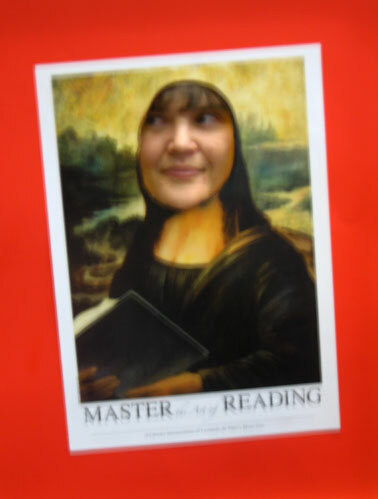 Our theme this year is “Master the Art of Reading.” So we took a poster of the Mona Lisa reading — and cut a hole for kids to insert their face. Nancy also added words to our display: Picture Yourself Reading. We had a lot of fun trying it out! Unfortunately, I had my camera set on no flash, so most of the pictures taken with it came out blurry. Anyway, here I am as the Sondra Lisa! I booktalked at three local elementary schools this week. A lot of fun, but tremendously exhausting! For the first and third schools, I had my co-worker Sue along, which does make it easier. For the second school, I was alone in the morning, and was joined by my co-worker Kumud in the afternoon. It definitely is nice to have someone share the talking! Though I was relieved to prove to myself that I can, in fact, pull off a booktalk on my own. The idea is that I’m going in to the local elementary schools and talking with each grade level. First, I tell them about the summer reading program. Then I let them choose from the books I brought along (from the featured books for the program) and I tell them how the books start, to try to pique their interest. I have about a half-hour with each grade level, so it ends up being 20 to 25 minutes of talking. 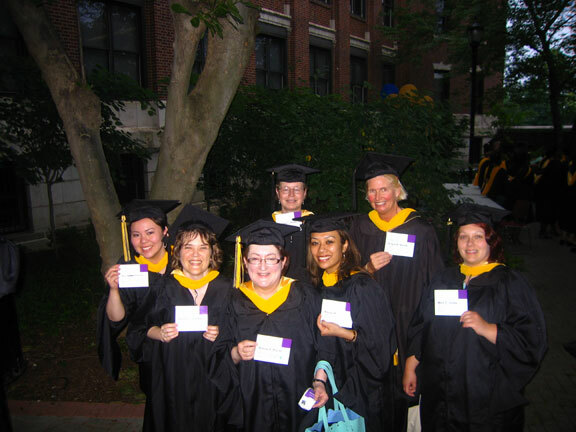 I was nervous about it: I became a librarian because I loved my job at Sembach Library so much. But I never had to do anything like this at Sembach. I didn’t even run programs at Sembach. What if I don’t like it? Will that mean I’m in the wrong job? But it ended up being a whole lot of fun. The elementary school kids are still cute and enthusiastic, and I am not trying to teach them anything — just tell them about something fun and tell them about some wonderful books. When they do seem interested in the books, it’s a great feeling. We did have some excitement on Wednesday, though. It was the day I booktalked the morning alone, and the air conditioning was broken in the room where I was talking, which made it all the more tiring. At the start of the next-to-last booktalk, the kids noticed the wind ferociously blowing outside with pouring rain and lightning and thunder. I said, “Isn’t it great we’re warm and safe inside?” and kept talking. But after awhile, they made me stop — because in the background, their tornado alarm was going off. I was glad the teachers were in charge and not me! The kids all knew what to do. They went in the hallways and ducked and covered. (It did not look very comfortable!) Some of the kids were crying. The power went out, and for a few moments there was no backup power, which was a bad moment of blackness. The teachers had mercy on them and let the kids sit against the wall after about ten minutes. I brought my bag with me into the hallway, so I was fortunate to have some reading material! They had to stay in the hallways for at least a half-hour. Driving back to the library, there were all kinds of branches and leaves in the road. I had to detour because of a downed power line, and there was no power in the library. But the books still worked! I sat under an emergency light and counted beads — we are going to have a big jar of beads for people to guess the number. And I need to get them counted first! It turned out that all the schools in Fairfax County had the tornado warning. Tim had to stay in the duck and cover position for a half-hour. Many reported seeing funnel clouds, but thankfully, I didn’t hear of any touching down. I was most stressed out, though, about the Algebra 2 Final Exam that my son had at 7 pm that night. I called, and they had power, so the test was to go on, even though another wave of storms was predicted for 7:30. Mapquest said it would take me a half-hour to drive to the test center, but of course it took a full hour. Through rain and a couple of places where traffic lights weren’t working. It was a very stressful drive. Fortunately, the worst of the next wave of storms happened while we were in the building. And at least now Tim is all DONE with Algebra 2. But it ended up being an extremely exhausting day! By the time I finished booktalking the next day, I was wiped out, and ended up getting a migraine just from tiredness. However, it was still a lot of fun! Next year I will try to make sure I schedule restful time after each booktalk and ask that I not be scheduled to man the information desk after a day of booktalking! But now I have a weekend to recover before next week’s round of activities. And when the preparation is all done and the Summer Reading Program is underway, I will get to celebrate by going up to Philadelphia to march in my graduation at Drexel! On my birthday! It will feel extra good to celebrate becoming a Librarian as I will have just completed my big event of the year for a children’s librarian — getting ready for the Summer Reading Program. You are currently browsing the Sonderjourneys blog archives for June, 2008.